The Wild Lander dropped us off in Aialik Bay and left without a trace. Built specifically for Kenai Fjords Glacier Lodge, it is a landing craft that can get close enough to shore to allow passengers to disembark via a short ramp at the front of the boat. 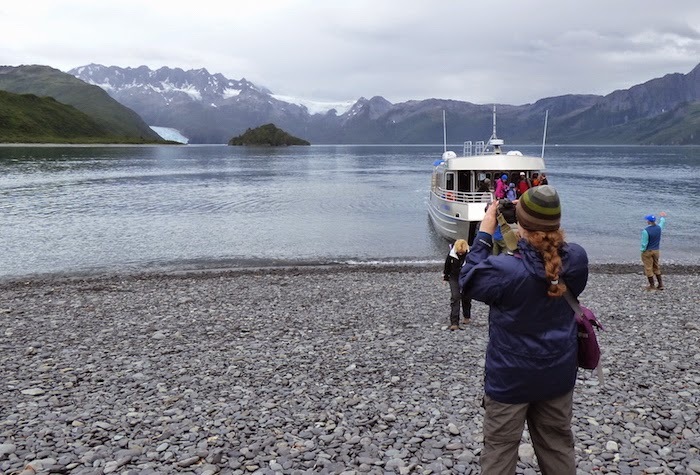 The boat then departs, leaving visitors standing on the beach’s gray stones, looking with excitement at Aialik Bay before them, a meadow and a forest on either side of them, and mountains in every direction. There is no dock here, and unless someone happens to be there to see the boat come and go, no indication that there is anything in this area except wilderness. One would never guess that there is an ecolodge hidden about a half-mile away in the forest. 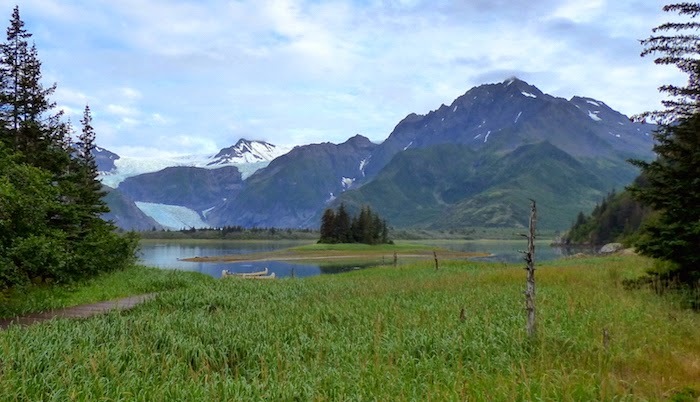 A representative from the lodge led us along a path, which leaves the beach, cuts across the meadow and winds into the woods on its way to Pedersen Lagoon. This narrow path also provides the only route for the lodge’s modest mode of transport - an ATV that can pull a small trailer filled with any supplies the lodge needs (which are also delivered via the Wild Lander). Just before entering the woods, another lodge employee came out to greet us and give a quick talk about the surroundings and how to explore them safely given the abundance of black bears in the area. That point driven home, we entered the woods and things became even more magical. The ground was blanketed with vibrant lime-green moss, and lupins growing up from the forest floor held single, shining drops of the morning rain in their leaves like perfectly set diamonds. This phenomenon fascinated me every day. The lodge appeared suddenly, blended perfectly into the woods, and my first impression was that it seemed small compared to what I had imagined based on website photos. This was a pleasant surprise, as it perpetuated the eco-friendly feeling that had been nurtured from the point of arrival on the beach. Before going in, we circled around to the back of the lodge and Pedersen Lagoon and were met with the view that I had been waiting for. During the months prior to this trip, I went online from time to time and looked at photographs of this spot, hardly believing that I was going to such a place and wondering if it would live up to the pictures. It absolutely did. Everyone gathered in the dining room of the main lodge for orientation from one of the lodge managers. We listened to a brief history of the lodge and learned how to help with its low impact philosophy during our stay. For instance, food is allowed only inside the main lodge in order to avoid accidental dropping of food crumbs outside, the scent of which could attract animals. Much work has gone into keeping the human presence here as low-profile as possible, and it’s never a good idea to give animals a reason to be curious about people. Snacks that guests have brought with them can be stored in cupboards in the lodge dining room and can be retrieved anytime. The main lodge is open 24 hours a day, and guests can go in and out as they please. Left: The back of the main lodge and the deck. Right: Inside the cozy sitting area of the main lodge. No one sleeps in the main lodge, however. Guests stay in individual cabins, which are tucked in the woods along the lagoon, each with its own view. Like everything else here, the cabins were built to be as unassuming as possible. From the main lodge, a boardwalk leads guests to their cabins. The boardwalk is raised above the ground to keep foot traffic from destroying the vegetation and eroding the ground. 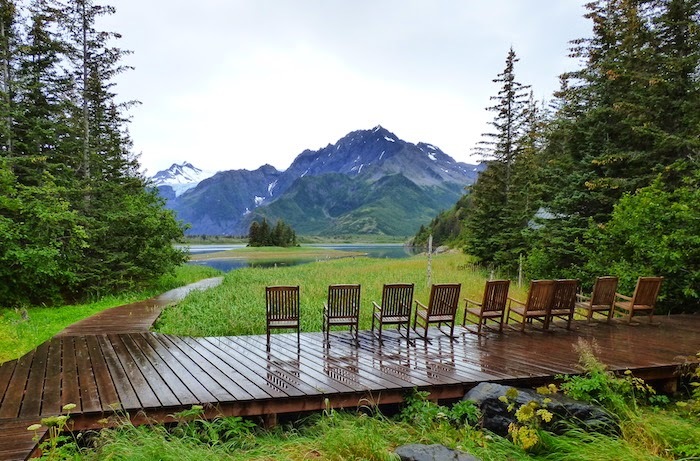 The cabins themselves are simple, with comfortable beds, propane heat, and a small back porch where guests can sit on rocking chairs and view Pedersen Lagoon and Pedersen Glacier. From the lagoon, the cabins’ presence is not obvious. Just enough foliage has been trimmed away from their porches to provide enough of a window to allow a view - nothing more. There are 16 cabins total, keeping the number of people who can stay here at one time small. Left: Looking past the end of the boardwalk while standing outside our cabin. Right: The inside of our cabin. Left: The back porch of our cabin. 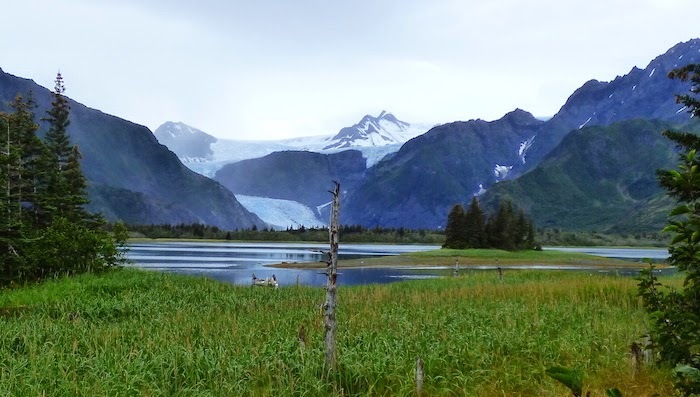 Right: The view from our back porch of Pedersen Glacier. Before heading to our cabin, we learned about the various activities that are available and how to sign up for them. Guests are free to take advantage of as many activities as they can fit into their stays, spend time exploring the lodge’s surroundings independently on foot, or simply relax at the lagoon. We stayed in cabin #2, almost at the end of the row of cabins south of the lodge. The cabin was perfect, and I was so excited about being there that I could barely contain myself. We had a few hours before dinner, which I wanted to spend at the cabin, just taking everything in. With all we had experienced that day during the boat trip here alone (amazing scenery, barely escaping sea-sickness, humpback whales flinging themselves out of the water right in front of us, etc. ), I was feeling a little overwhelmed and wanted to just sit and absorb. Andrea, however, felt differently. A couple of the guides were taking canoes out for a leisurely paddle around Pedersen Lagoon with any guests who wanted to join, and she felt that was a better use of our time than sitting in a stupor like I wanted to do. So we went canoeing. Some kind of alert had obviously been transmitted prior to our arrival concerning my fascination with sea otters. As if I needed more encouragement to take notice of them, they floated and bobbed all around us, looking mind-bogglingly furry and adorable while we paddled around the lagoon. Even back at our cabin, a photograph of a sea otter hung above the bed I slept in. It was like being stalked in the cutest way possible. The occasional harbor seal poked its head above water for a few seconds before disappearing and popping up somewhere else, ensuring no one could take a decent photo. This would be a reoccurring theme over the next few days. Someone made a “loose seal” joke, and there was a lot of laughter. Sea otter in Pedersen Lagoon. Photo taken by Andrea. Dinner was served in the dining room of the main lodge at 6:30 pm and it was fantastic. Salmon, quinoa, roasted vegetables, and salad were served family style, with carrot cake for dessert. After dinner, we signed up for the following day’s recreation, choosing two half-day adventures, which I will discuss in the next post. Later in the evening, we returned to the dining room for a presentation about the building of the lodge, which was impressive, and we were surprised to learn that it has only been around for a few years. Most nights there is a presentation of some kind for anyone who wants to watch. 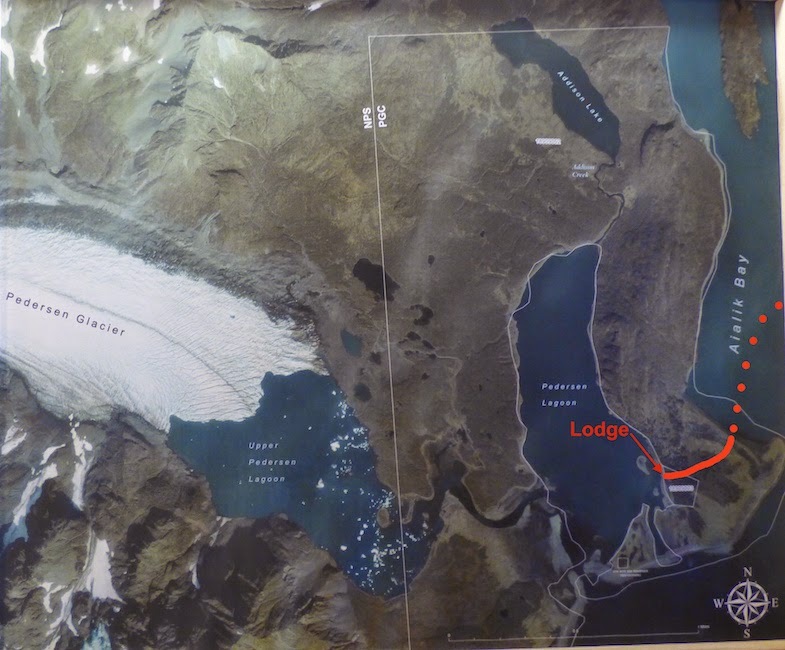 The night before we arrived, one of the guides gave a presentation about glaciers, which we wished we would’ve seen. After the presentation, we returned to our cabin to turn in for the night, but I was way too excited to sleep. I laid awake for hours listening to the rain and hatching schemes in my mind to hide in the cabin at the end of the trip and stay there forever. 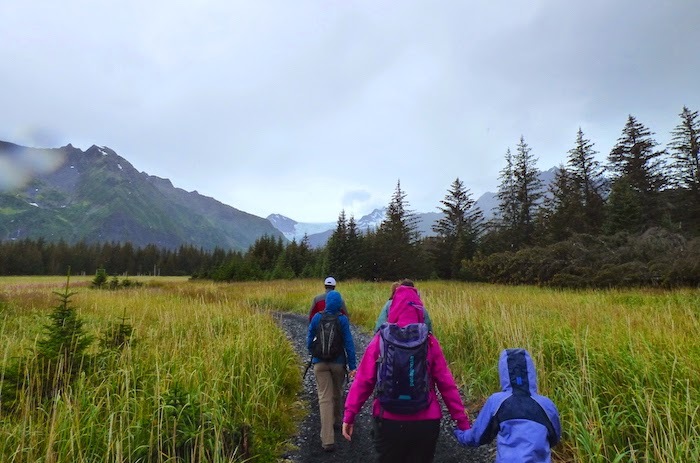 The boat dropped us off in Aialik Bay, and we followed a path to Kenai Fjords Glacier Lodge on Pedersen Lagoon. Your pictures so gorgeous that they're almost unreal. I'm hugely envious -- and eagerly awaiting the next installment! Thank you - the whole trip was unreal! It's a little overwhelming to write about, which is part of the reason it's taking me so long. Thanks for reading. You're such a good travel writer Nina - you should definitely do a book. Thanks Andrew, and thanks for reading! Just beautiful! Thanks so much for this blog! Thanks, Roland - I appreciate the comment!